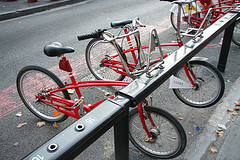 While some may debate the finer points of bike sharing in New York–What will the bikes look like? How many gears will they have? Where will the stations be located? How much will it cost?–I prefer to spend my time imagining how newspapers and TV news stations will report on the scheme when it finally debuts. Why? Because sometimes the outright predictability of this city’s media is one of the best things about living here. The Times’ Spokes blog could simply post the words “bikers,” “pedestrians,” and “bike lanes” and such a post would generate over 100 comments in a matter of hours. When the Mike Bikes program is finally rolled out, expect the Times, Post, Daily News, Marcia Kramer, and other hysterics of the media world to pepper their stories with anecdotes about minor accidents, thefts, and other incidents all the while putting a very negative spin on a program that will ultimately prove to be very successful and popular. I’m willing to bet my bike on it. So, New York media, allow me to do your job for you. Look into my crystal ball as I present the Top Bike Sharing Stories of 2012! Theft and vandalism prove that bike sharing doesn’t work in New York. 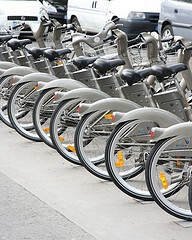 According to Streetsblog, over 8,000 bikes in the Paris Velibe program were stolen and another 8,000 were “rendered unrideable and irreparable,” by being vandalized or, in some cases, dumped into the Seine. In a city that has its own Kryptonite lock named for it, theft and vandalism are real concerns for anyone hoping to leave upwards of 10,000 bikes out on the streets. It’s also something the Department of City Planning addressed in its 2009 Bike Share Opportunities Study. The company that runs the bike sharing program will have to do all it can to ensure a minimal amount of theft by designing a good locking mechanism or making program-specific parts that won’t work with other bicycles. But one fact remains: bikes will get stolen. That’s life. Any car rental or insurance company builds theft, accidents, and vandalism into its budget projections and the bike sharing program will do the same. The question should not be whether or not bikes will get stolen–they will–or whether or not bikes will be dumped into the Hudson–they will–but whether or not the rate of theft and vandalism is within the acceptable levels projected by those running the scheme. Prediction: Within six months of the bike sharing program the Times will report on a stolen Mike Bike that has turned up in Africa, China, or on eBay. Accidents and fatalities prove that bike sharing doesn’t work in New York. In the most hopeful of situations, the Mike Bikes program will introduce hundreds, then thousands of newbie riders onto New York City streets. Accidents will be an inevitable, if unfortunate, result of flooding the streets with a new form of transportation. But just like theft and vandalism rates, the city and bike sharing company will probably build accident and fatality projections into the program. They’ll have to. The city has insurance to cover accidents involving people who trip on sidewalk cracks, so you better be sure they’ll have it for this. I’d bet that membership payment forms will be accompanied by a contract that puts all the risk of usage on the rider. Never mind that the bike sharing program may offer a huge opportunity for promoting safe, legal cycling in New York. The threat of losing one’s membership or being fined if caught “salmoning” or running red lights while on a Mike Bike may be enough to change a lot of cyclist behavior. No bike sharing program has been able to require helmet use so far, but signage at bike stations can be used to promote basic safety. And it goes without saying that getting people out of cars and onto bikes will slim waistlines and promote cardiovascular health at a rate higher than the occasional accident. A newspaper will interview a bike shop owner who claims that his sales have dropped due to the Mike Bikes program. Mike Bikes will be a ripe target for any disgruntled bike shop owner already on his way to closing his shop, with or without such a bike sharing program. On the verge of going out of business anyway? Pin it on Mike Bikes and call CBS 2! Even though bike sharing programs are designed to encourage casual, no-lyrcra-required riding, Mike Bikes will do to cycling accessories what a new iPhone release does to carrying case sales. Bike stores will be champing at the bit to sell their products to the thousands of new riders whizzing by their stores. The smart shops in town will ride the wave that the Mike Bikes program generates, marketing fashionable cycling clothing, bags, helmets, and other basic accessories to users. Shops will offer discounts to program members. Since you’ll only be able to lock your bikes safely at stations in the program, some bike shops will offer secure Mike Bike parking for customers if no station is located nearby. I’d wager that restaurants will get in on the action as well; how long before we see the first Mike Bike valet station at some trendy Village bistro? A TV reporter will broadcast live from a bike station that’s completely full. This will be used as evidence that the city grossly overestimated interest in a bike sharing program. A TV reporter will broadcast live from a bike station that’s completely empty. This will serve as evidence that the city grossly underestimated interest in a bike sharing program. What are your predictions for Mike Bikes? Write your own headlines and stories in the comments. May 25th, 2014 – 18 Rogue Cyclists Rounded Up by NYPD at Anarchist GroupRide! NYPD, through amazing feats of derring-do, collared 18 dangerous, rogue cyclists last Friday night at the Astor Place Cube Bloomburg Pop-Up Club. The un-licensed, un-insured riders were using un-registered bicyles for blocking legal traffic outside of designated bike zones. The group stunned the clubgoers, but fortunately for those held hostage by the noisy miscreants, a pair Mike’s Bikers in a nearby bike zone heard the commotion and contacted the NYPD’s Bicycle Control Unit. Helicopters and quarantine nets were deployed to contain the cyclists circumventing the City Bike Fees. A police spokesperson stated 4 rouge riders critically injured themselves attempting to evade the law enforcement pursuing in the new electric-powered “Mega-Interceptors.” No confirmation yet as to how many members of the now-banned “TA” BikeGroup were apprehended in response to the noise complaint. I think most of your predictions are spot-on except for it cannibalizing bike sales. I would argue that most people who will use the bike share are people who are a) tourists, or b) locals who don’t have space for a bike in their tiny apartment in the first place or live in the outer boroughs and wouldn’t use a bike otherwise when in the CBD. To be clear, I don’t think bike sharing will hurt bike sales in the least for reasons including the ones you cite. I just think the media will find someone who claims his business has been hurt by the program and give him the megaphone provided by print coverage, even though there will be no evidence to pin his failing shop on bike sharing.